There are many pests which are drawn to areas where moisture accumulates. Moisture allows many things to thrive; it is the basic ingredient for life. Besides the thousands of microscopic organisms, many insects and other creatures will readily live where it is damp. Among these creatures is the pillbug. This article will explain some basic biology of this isopod and explain how to treat local infestations. 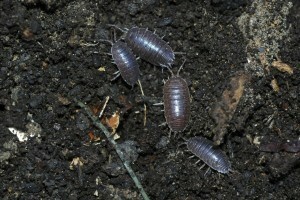 Pill bugs are small, about 1/2″ to 3/4″ in length, gray in color and oval. They live under rocks, logs, mulch, wood chips and all around the home where it is damp, dark and moist. Generally you may see hundreds or thousands of them emerge when you attempt to do some gardening and begin to disturb the soil. Though generally not a destructive pest, pill bugs will readily move under slabs, into doorways and window frames which accumulate moisture. This moisture may form due to leaks or condensation and with this moisture comes mold, mildew and algae – the basic food stuff of these pests. Established colonies of pill bugs will move inside when moisture levels are too high or to seek relief from either cold or heat. It is when they migrate into living areas that people first notice just how bad of a problem they have. 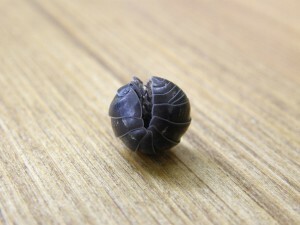 The pill bug is unique in that it can roll into a round ball thus achieving a good defensive position. Pill bugs will bear young at least twice a year and carry them until the young are able to keep up with the rest of the colony. Though the young may leave mother from time to time, it is not uncommon for them to come back and allow her to bear their burden for as long as she can. In effect, the moisture will allow the pest to be ever present – the ones you kill will quickly be replaced by new pill bugs seeking shelter and food. If the local conditions are OK but you have a lot of mulch, rock, pine straw, wood chips or other objects around the perimeter of the home, expect the activity to continue. But even as the moisture is reduced, the problem will most likely require some treatments to remedy it for good. Next, spray the foundation and ground areas with DFENSE. This concentrate is unique in that it will stay on the surface of any porous substrate like cement and wood much longer compared to emulsifiable concentrates. Mix .5 oz per gallon of water and apply monthly where pill bugs are active. Once the problem is gone, treat every 3 months to insure they don’t return. When spraying, get at least 1 foot out from the home on top of the turf, soil or mulch and end where the Talstar Granules will be active. Since mulch, siding and plants are where pill bugs like to live, treatment needs to address these locations around the structure. Do this at least once a month. When local activity has ceased, you may be able to go a little longer between treatments. Also spray at least 2 feet up the side of the home. On siding where pill bugs are higher, spray higher to establish control. If you have pill bugs in the home, garage or basement, inside treatments will be necessary. 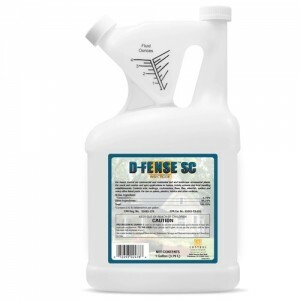 Use D-Fense on baseboards in rooms where activity is seen. This is likely to be in garages, crawl spaces and around doors. Dforce will kill pill bugs quickly since it’s both a contact killer and a flushing agent, it will chase them out of hidden spaces. 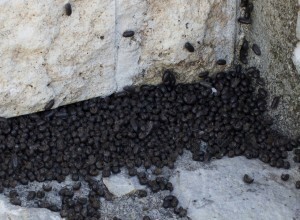 Pillbugs can become a problem in and around the home. Though they don’t cause damage, they can be a pest. Use Talstar Granules and D-Fense outside the home to kill off local infestations. Eliminate moisture for long term control. Treat cracks and crevices inside with Dforce Aerosol to quickly control any which are nesting in the home. Forget using “over-the-counter” products and get what we recommend in our article above. Basically this is what professionals use and no doubt the Talstar will knock them out for good. Now you will have to treat the outside of the home as our article explains but if you follow our instructions above, I’m sure you’ll see positive results. I have pill bugs invading my living room most commonly seen on the tile or carpet around my gas fireplace. I fear they are coming up from the basement through a nearby vent. Is there anything I should use??? Because the vent cannot be blocked off. I wouldn’t worry about the vents. Chances are high the main population is just outside the home. Pillbugs love cement and will readily nest on foundations, the mulch that surrounds most any homes adjacent to foundations and especially on any chimney. For starters, I’d focus my attention to the outside as explained above in our article because in the end, if you don’t get them outside, treating inside will never get rid of them for good. That means applying Talstar Granules to the outside of the home. You’ll need to focus on the exterior of the house including your turf, flower beds or any mulch that butts up to the home. Next, spray the foundation with Talstar. 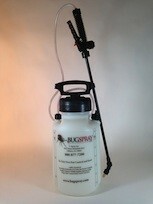 Use 1-2 gallons of mixed spray every 1-2 months; this will keep them (and all other pests) under control. Lastly, get some Phantom or Dforce for use inside. Use it to treat all the cracks and crevices in the room where you see activity. Dforce will provide a quick kill but it does have an odor and tends to go on wet. Phantom is odorless and goes on dry but it will take a day or two to kill targeted pests like pillbugs. Lastly, go down the basement and treat with a combination of the Talstar liquid mixture and which ever aerosol you get. No doubt pillbugs love basements (these areas are typically dark and moist). And once the pillbugs are in the basement, they’ll readily find their way upstairs to your living spaces. In the basement, use the Talstar to spray foundation walls and basically the perimeter of the room. Next, use the aerosol to treat the ceiling areas – especially just under where you’re seeing them upstairs. I am having heavy concentrations of pillbugs in the new home I bought. I’m still finding them in the winter when temp gets above 40. I am using talstar granules and spray I have left over from you from old property. I think they are coming in under the vinyl siding. The house had been vacant awhile and the eves were draining into the foundation which I am sure was helping to build up the population. I realize it will take awhile to get the population under control but I would really like to stop the movement into the home from the siding or even basement patio door. Is their a dust I can use down at the bottom of the vinyl siding? Any other thoughts? Thanks. No doubt a lot of moisture distributed around the home from a leak can lead to all kinds of insect problems. Pill bugs are but one species which loves this kind of environment. Pill bugs will typically move into the ground surrounding the home once they discover moisture is available. Key spots for nest sights include pine straw, wood chips, rocks and around any plants (bushes, ground cover, flower beds, etc.). To control them in the ground, you should first apply a band of Talstar granules around the perimeter. Be sure to treat at least 10 feet “out” from the foundation on every side of the home which has dirt. And be sue to renew the treatment every 30 days – even during the winter. Next, spray over the top with some Talstar concentrate. You’ll need to apply 3-4 gallons monthly to the ground and the homes foundation making sure to come up the foundation at least 3-4 feet when spraying. We find many people don’t spray enough material per application (they tend to stretch the liquid too far) which won’t work for this pest. Heavy spraying is definitely required so be sure to apply enough. Now if the main nest site is any of the treated areas, you should see improvement within 1-2 weeks of your initial applications. And within 1-2 months, the problem should be resolved. But in some cases pill bugs can move up under siding when moisture is allowed to persist. And homes that have vinyl siding are very much prone to this issue so my guess is you are right in wanting to treat under the siding. Personally I’d focus on getting a dust up under the siding around the entire home. I’d also treat “up” the siding injecting the dust every 2-3 rows and going up to as high as I can reach. Now because of how dust products move once injected, you’ll only need to puff some in every 2-3 feet across any one row. This might sound like a lot of work but dusting is fast and only takes a second or two per spot you treat. You will need a hand duster to make the application but this will enable you to work fast and efficiently. And for my time and money, dusts are the best formulation on the market – especially when dealing with hidden voids like under siding. As for which dust to use? This is a tossup depending on the current condition under the siding. Let me explain.. If you think moisture is still a problem, go with Deltamethrin Dust. It’s designed to better handle moisture and a thorough application can last 3-6 months. But if you are 100% sure the moisture issue has been resolved, then in theory it should be mostly dry up under the siding. And if thats true, the Drione dust would be a better dust. Drione is active on all pests and can last twice as long as the Deltamethrin. This makes Drione the preferred choice whenever possible. Now just to be clear; I wouldn’t attempt to treat all the siding from the ground to the roof. But I would go up 3-5 feet from the bottom. And if you stick the tip of our duster along the slight gap found under every row of the siding, you’ll be able to inject plenty of dust to do the job. Thank you for sharing the product information. I have an organic garden, are the granules OMRI approved? It will handle pillbugs well too.